Sometimes I think too much. I think of what I can do more, what should have been and could have been. A friend of mine's tells me"you over analyze everything." Maybe I do? The good news is that I have an opportunity to do something about all the thoughts that are not well-pleasing to God, before they enter my heart and become a part of me! Our minds can be a battlefield. 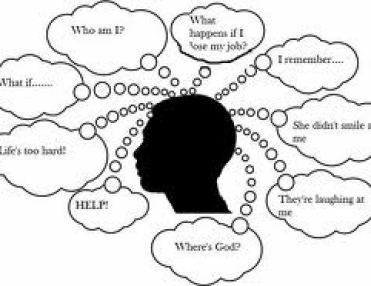 The enemy of our souls bombards our mind with cleverly devised nagging thoughts, suspicions, doubts, fears, wonderings, reasonings, and theories. Jesus says, "....for he is a liar and the father of lies." (John 8:44) He tells us things about ourselves, about other people and about circumstances that are just not true. A stronghold is a mental argument you believe that contradicts the person and power of Christ. A stronghold is a thought fortress of arguments designed to take your mind captive and hold you prisoner. These fortresses are designed to negate the person of Christ and His power (the Gospel) in your life. (1) What lies keep the Gospel from dominating your thought life? (2) What strongholds have been set up in your mind, which hinder the sanctifying work of God in your life? (3) What sinful thought fortresses reside in your head? Lies you tell yourself – I have to be perfect. I must be happy. I need people to agree with me. I cannot shake my past. I deserve better than this. Lies the world tells you – I must be true to myself. I am number one. I am only human; everybody makes mistakes. Lies you say in your marriage – It is your fault. If I had not married you. You make me so mad. Why can't you be like so and so? I wish I was like so and so. 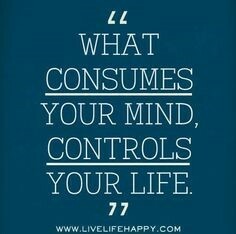 What consumes your mind, controls your life? What you decide to obsess over in your mind, ruminating … reviewing … rewinding … will ultimately be what controls you. How can we control the thousands of thoughts that enter our mind each day? How do we take our thoughts captive? Take your negative thoughts captive through confession. Paul urges us to "take captive every thought to make it obedient to Christ" (Rom. 12:2). Confront your negative thoughts each time they pop into your mind. But it is possible with the help of the Holy Spirit.Turn them over to God and become who He sees you can be. Choose to focus your thoughts on the right things. We are to think about those things that are "true, noble, right, pure, lovely, and admirable" (Phil. 4:8). We then take every thought captive.” It’s like when you move in a battle and you destroy the fortress and then you take captives. We take every thought captive to obey Christ. When we apply this to ourselves, we have to make sure we are in the right place in the text. When Paul says first he is destroying arguments and arrogant opinions against God and, second, that he is taking thoughts or minds captive, we need to realize it is the minds and thoughts of others. He is not talking about taking his own thoughts captive. It is the thoughts of others. By the Holy Spirit we can get grace and power to bring the thoughts into captivity to the obedience of Christ, and in this process, we become transformed into the person God wants us to be.